Ministry of Stories | D.A.R.E. DARE is working with the Ministry of Stories to research young people’s creative writing. The MoS is in Hoxton in Hackney, London (the imaginative MoS ‘shop front’ is worth a visit in its own right!). MoS run after school and Saturday writing workshops for any young people who wish to join, as well as bespoke projects with schools. MoS was founded with the help of the author Nick Hornby. You can read more on their website. The DARE team is Dominic Wyse, Andrew Burn, John Potter, Jane Coles, Theo Bryer and Gill Anderson. The project researcher is Helen Bradford, based at the University of Cambridge, who is conducting annual interviews with participants. The project will produce new evidence on the ways that a creative approach to writing, with the support of volunteers, can impact on young people’s writing, creativity and motivation. The Ministry of Stories is a creative writing and mentoring centre for young people. Its main aim is to unlock the creativity and develop the potential of young people to become better writers. It inspires 8-18 year olds through the power of storytelling, unleashing their imaginations, building their confidence and self-respect and enhancing their ability to communicate. It all begins when visitors arrive and pass through Hoxton Street Monster Supplies, purveyor of household and fancy goods to every imaginable monster. Stop and shop for fang floss and tinned fear or continue through the secret door to the Ministry. Working with schools and individuals from east London, the programme includes all forms of writing, from song lyrics to play scripts, screenplays to journalism, blogging to games, and poems to graphic novels. Recent projects at the Ministry of Stories have included a local newspaper written by children, an online soap opera set in Hoxton and an illustrated Guide to Monster Housekeeping. We have now completed the first two years of the study, and have submitted the reports to MOS. You can download summary versions below for teachers. The full reports will follow; but an extract from the Year 2 Executive Summary giving a more detailed presentation of the findings follows. Most of the young people’s comments revealed very high levels of motivation for writing in part as a result of successful workshops. For example, one of the series of workshops run during the year, on settings and characterisation, was popular with the young people. Choice and freedom have been key themes in relation to writing and motivation for the YP this year, and for the work of the MoS more generally. The end of year interviews revealed very high scores out of 10 in response to the question about how much the YP liked MoS; this was clear evidence that the young people are motivated by MoS. When analysing the case studies of young people a more complicated picture of enjoyment of the MoS, and writing, emerges but still within the context of general high levels of satisfaction. In addition to general positive comments about MoS the young people also clearly recognised the value of improving their writing that MoS provided. Some of the young people had developed more sophisticated ideas about how the approach of the MoS differed from the approach to writing at their schools, which in general they liked less than the MoS approach. The reasons that the YP gave for joining MoS in the first place provided thoughtful evidence in relation to their perceptions of the MoS. There was evidence of higher levels of creativity in writing than in year one although this finding has to be interpreted cautiously as there was a significant level of attrition in the sample of young people who are the subject of the case studies (CSCh). This attrition means that the gains in creativity could be the result of individual characteristics as much as the changes in approach to writing at the MoS. An area of development for MoS, the mentors, and the approach to writing will be to revisit understandings of creativity, and its definition as articulated in the IOE methodology, in order to more deliberately encourage key aspects of creativity in YP’s writing and to refine the assessment of creativity. The young people had developed their understanding of the place of communication and expression in writing. One important area of development was the growing confidence to see the transcription elements such as handwriting, punctuation and grammar as subservient to the main reasons for writing which are tied to the compositional processes. For example fluency in handwriting was beginning to enable the YP to manipulate language and grammar to greater effect than in the previous year. Another significant development was the understanding shown about punctuation being seen by some of the YP as a tool to help convey meaning. Another theme that emerged this year was the CSCh’s appreciation for being able to talk at any time in the writing process. Many appreciated the fact that they could either talk to their friends, and the mentors, if they needed help or to explore ideas further, in contrast to the school environment where talk is frequently discouraged during independent writing. End of year attainment data in writing and reading for the CSCh who were part of the longitudinal study has been analysed in comparison with 106 control children (from three schools). Initial analysis of end of year five assessments revealed that there was no statistically significant difference between the overall levels of attainment of the CSCh and the control children. This suggests that the children who attend MoS have attainment levels comparable with their peers who do not attend. Initial analysis suggests that a greater proportion of CSCh’s writing has improved than those CSCh children who have not progressed in assessment levels. In addition, no CSCH’s writing scores declined, unlike the control children where 21% (n=22) of children’s writing attainment scores fell in the same period of time. Although overall there was no statistically significant gain for writing or reading attainment for CSCH vs. control children, there were statistically significant gains for writing for CSCh in lower attainment groups or higher attainment groups. Impact on those who struggle with writing is an important finding, as is the positive impact on those children in high attainment groups. Further thinking may need to be done to understand the non-significant impact on medium attainment children, although the very small numbers of CSCh in each attainment level must be kept in mind (four, five and six children respectively). The end of year three data will be important to further investigate these attainment data findings. While in general the work of the mentors is welcomed by the young people, the irregular patters of mentor engagement with the MoS remain a challenge. There is also a need to develop the support for mentors. One aspect of this support is the need to review mentor training. For example while aspects of behaviour management are a vital part of mentoring, knowledge about writing, writing processes, and supporting writing are important areas of mentoring that mentors could beneficially be taught about. There is the possibility here to develop a series of resources as part of a more systematic programme of mentor training. One useful starting point for materials/training could be to explore what is meant by ‘creativity’ and things that might help or hinder its development as part of the writing process. There was evidence that the teacher’s role was more substantially integrated into the model, in the Planting Poetry project, addressing a recommendation from the Bottled Emotions project in Year 1. The LWP was a very valuable contribution to supporting YP’s writing, and to the MoS portfolio of projects. The identification of a real audience and purpose to contextualise the writing was one of the excellent features, as were the opportunities for the YP to think creatively. Planned tasks and activities to stimulate writing should be balanced carefully against the overall aim to give opportunities for extended writing. Tasks should continue to be used as one means to increase motivation for the work of the MoS, but tasks could also be planned on the basis of observation, analysis, and recording of the interests and needs of the young people assessed as they experience the processes of writing. The GFP collaboration with the Roundhouse was ambitious, and successful in many ways, in its aim to relate creative writing to game design. It clearly increased the motivation of the young people, developed aspects of creative writing, and addressed emerging questions about the relation of the arts in education to programming and new media production. The evaluation produced a recommendation to run a similar project again, in view of these valuable connections, and noted the benefits of the expansion of conceptions of literacy and narrative beyond linguistic forms and into visual design and programming. Specifically, it recommended a greater variety of software (beyond Scratch), and a better balance between story-making and ludic design. 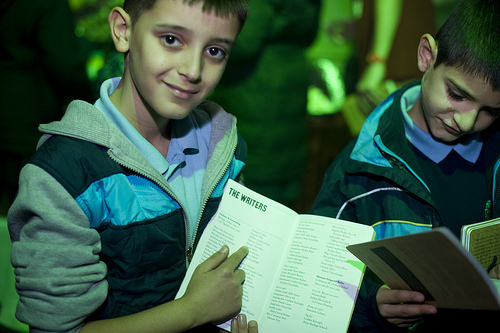 The Planting Poetry project made a valuable contribution to supporting pupils’ writing. One of the key features that contributed to its success was the celebratory nature of the end of project event that gave all of the children an exciting (and challenging) platform from which to share their compositions with parents and carers. The garden installation further raised the public visibility of their work, with pupils voicing real pride in their achievements. The intent of the professional storyteller to include all children in the project was in tension with the selection of poems, rather than inclusion of all poems, in the final product. This issue of inclusion also was highlighted by the exclusion of one of the pupils from the project as a result of misbehaviour not connected with the project.